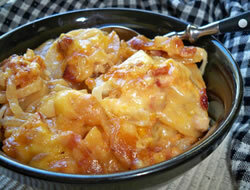 Tasty scalloped potatoes with a creamy sauce with a light cheesy flavor. 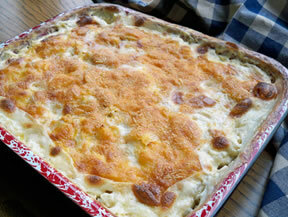 A simple scalloped potato recipe that makes a great side dish. 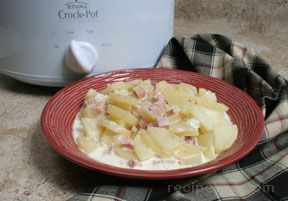 Layer sliced potatoes and soup mixture, ending with soup mixture on top. Cover with foil and bake @ 350 for 1 hour and then remove foil and bake for another 20 minutes or until potatoes are fork tender. "I made these to go with the Easy Slow Cooker Pulled Pork sandwiches for my dad's 60th birthday party. I made two pans, cooked them in the oven and then put them in a crockpot to keep them hot for the party. This worked out great. I would have cooked them in the slow cooker but wasn't sure how long the raw potatoes would take to cook. 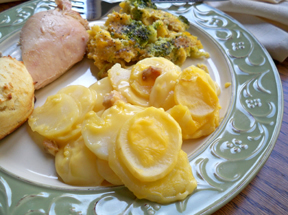 This was a simple recipe and tasted great."